Vegan Cuts, a site popular for their monthly Snack and Beauty box subscriptions, recently released a few limited edition boxes — including a Family Starter Kit! The Family Starter Kit features a variety of vegan-friendly items designed for babies, toddlers, and parents. 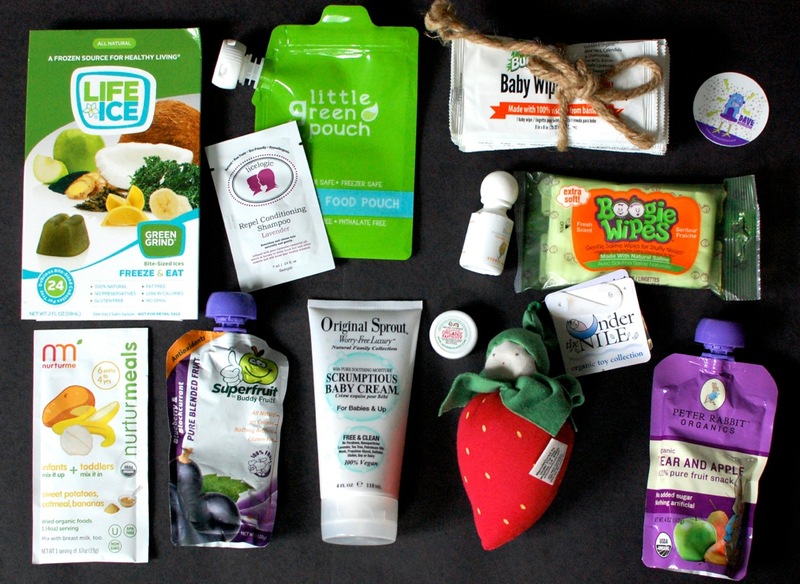 It includes 12 products from some of the top eco-friendly, cruelty free, baby-pampering brands. This is a one-time purchase of just $27.95 (shipped free to the US) and promises a $47 value. I was recently sent a kit for review, so let’s see what was inside! Buddy Fruits Superfruit Pouch – My girls are almost 2 and still LOVE fruit & veggie pouches. Since they’re usually made with 100% natural ingredients, I’m more than happy to let them have ’em. This one is a blueberry and blackcurrant blend made with 100% fruit. Peter Rabbit Organics Pear and Apple Pouch – I’ve actually had the opportunity to review these pouches not too long ago and I was a big fan. (The girls were too!) All of their pouches are made with nothing but organic fruits and veggies. No worries about dairy or other non-vegan ingredients in these guys! Little Green Pouch Reusable Food Pouch – If you’d rather go the DIY route, these reusable pouches make it easy to store/serve your own homemade fruit & veggie purees. They’re BPA-free, PVC-free, phthalate-free as well as dishwasher and freezer safe. Under the Nile Strawberry Plush – How adorable is this lil’ fella? I’ve seen these sweet plush fruits and veggies and always wanted to get one for the girls. Sure, they may be a little old for it at this point, but I’m holding onto it anyway. (For myself? Perhaps.) All of Under the Nile’s toys are handmade with 100% organically grown Egyptian cotton. They also use fair trade business practices. I’m sooo tempted to get this 5-piece set I just found on Amazon — only $25! Ahhh! That carrot is TOO cute! Original Sprout Scrumptious Baby Cream – I was excited to see this in our box. For whatever reason, we have a bazillion bottles of baby wash/shampoo, but hardly any lotion. This is a nice sized 4 ounce tube of super gentle moisturizing lotion for babies, kids, and even adults. It’s 100% vegan and features soothing zinc and calendula extract. Boogie Wipes – I remember seeing these in a store when I was still pregnant and wondering why the hell I would ever need a product that I assumed was basically the equivalent of a tissue. Oh, silly pregnant Wendy… Turns out, I LOVE me some Boogie Wipes! Tissues are great and all, but that dried up crustiness on your kiddo’s face when they wake up from their nap? Good luck gettin’ it off without a Boogie Wipe! They’re super soft (and strong!) wipes made with natural saline to gently remove all that icky, dried up gunk. Plus, they smell good. Beat that, tissues! BumBoosa Baby Wipes – I’ve gotten these wipes in a few other subscription boxes over the last few months. They’re actually made from bamboo and are really soft/gentle to the touch. It contains a plant-based formula that’s infused with natural essential oils. 20 individual wipes were included. Nurturmeals Dried Organic Baby Food – This is a packet of dried sweet potatoes, oatmeal, and bananas. You simply mix it with breast milk, formula, or water to create a puree for baby. My girls were never a fan of this as infants, but maybe now that they’re older they’ll be more open to it. That, or I’ll just toss it into a smoothie. Licelogic Repel Conditioning Shampoo Sample – This is a gentle, non-toxic shampoo that repels lice for up to 24 hours. Life Ice Freeze & Eat Bites – All natural, bite sized ice treats that you simply freeze & eat. “Green Grind” is a blend of fruit & veggie purees/concentrates including banana & kale, as well as other natural ingredients like spirulina, ginger, and green tea. There were also a few coupons in the box, including one for 20% off Faux Moccs! I thought the Vegan Cuts Family Starter kit had a nice variety of different products for both babies and toddlers. It would also make a great baby shower gift for vegan and non-vegan mommas. Interested in ordering a kit for yourself? Just click here for more details! Don’t forget to check out their monthly snack and beauty boxes too! Disclosure: I received this kit for review purposes. I was not compensated in any way. All opinions are my own. Post may contain affiliate links. That Life Ice is a neat idea, especially for the summer time. Im just wondering if my daughter would eat them or not. How did your girls like them? Oh and that strawberry plush is adorable!